EA SPORTS is launching EA SPORTS Season Ticket, a new subscription based service that will allow members to download full games early, a discount on DLC, free premium web content, and membership recognition. Available starting today in the X-Box Live Marketplace, PlayStation Network Store and exclusive North American retail partner GameStop, gamers can purchase a yearly membership for $24.99 (or 2000 MS Points) that will allow them to download full EA SPORTS titles over three days before the full retail release. The games confirmed to be part of the program at launch include: Madden NFL 12, FIFA 12, NHL 12, Tiger Woods PGA TOUR 13, and NCAA Football 13. More titles may be added at a later date, but NBA Jam: On Fire Edition is confirmed to not be part of the program. Beginning at 6 PM ET on the Friday before retail release, gamers will be able to download the full version of participating EA SPORTS titles. This download will remain active with full online features (except Ultimate Team) until 6 AM ET on release day and at that point the download will expire. Gamers will then need to purchase the game at retail to continue their experience. All in-game achievements will carry over to the retail version of the game. EA SPORTS Season Ticket subscribers will receive a 20% discount on all DLC, including Ultimate Team packs, accelerator packs, gear upgrades, and more. They will also receive free premium web content available for the duration of the subscription. For example, non-subscribers will have access to a basic version of the FIFA Creation Center while subscribers will have access to premium Creation Center packs. Subscribers will be given visible membership recognition in-game and also on their EASPORTS.com profile. The subscription is valid for 12 months from the date of purchase. Should Madden NFL 13 return to its normal mid-August release date, an EA SPORTS Season Ticket subscription purchased in late August 2011 would allow subscribers early access to Madden NFL 12 and Madden NFL 13. 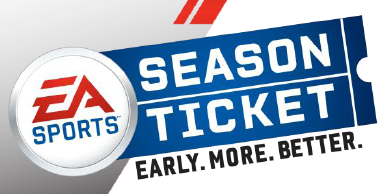 Online Pass is not required for EA SPORTS Season Ticket. All online features (except Ultimate Team) will be available for play during the early weekend download access. The program will be available on X-Box 360 (North America, Europe, Australia and New Zealand) and PlayStation 3 (North America). What are your thoughts on the EA SPORTS Season Ticket program? Share your thoughts and feedback below. I'm sure it will be a big success...we are a "i want it now", "give it to me", "i want it i want it" consumer base. I wonder if this will affect the release time of demos. I know the demo isn't a full game but its usually enough to wet my appetite until retail release. From what I understand of the program--which, admittedly, isn't much at this point--the understanding is that this will be something that won't be adopted by everyone in the gaming community. Thus, the goal is to not change a lot of things about how the games are typically released and experienced. As such, I would expect demos to continue coming out at a fairly normal timetable because not everyone will be banking on getting the full downloadable trial three days before retail release. There are definitely some cool perks if you're somebody who's a big fan of EA SPORTS titles over the course of the year. After reading how many people were willing to spend somewhere between $40-$50 over retail for NCAA Football 12 to get it the weekend before release, I have to imagine that some of those people will consider picking up the EA SPORTS Season Ticket so that they can download the game early and give it a trial run before it's released at retail; they'd even be saving money versus paying that extra "finder's fee" to get it early from somebody. If you were to download all five games which are guaranteed to be on the Season Ticket for the first year--Madden NFL 12, NHL 12, FIFA 12, Tiger Woods PGA TOUR 13, and NCAA Football 13--then you'd have 15 days of pre-release time with the games on the year. If you take the base price of $24.99 and divide it amongst the days, it works out to about $1.67 a day for early access to those titles. Obviously your "value" goes down somewhat if you choose not to download the trial of one or more of the games, which is why they're emphasizing the program having a specific market. The DLC discount is pretty solid at 20%; for example, I bought all of the courses for Tiger Woods PGA TOUR 12: The Masters. I believe one pack retailed for $34.99 and the other was $14.99; if the program had been in place before that game came out, I could have gotten the DLC packs for $27.99 and $11.99 respectively for a savings of just under $10 total. Free premium web content is cool, although for most of us here our primary web experience would be with NCAA Football and we won't get any perks for the franchise until NCAA Football 13 comes out. The emphasis on this content may also mean that we'll see more of the franchises using web-based tools to supplement the console experience, which is reflective of the apparent EA SPORTS trend to allow more computer-based tools to be available. I don't know if I'm going to run right out and subscribe, but it's definitely something I'll be considering as I think about the overall cost compared to potential savings. I would have liked to seen a little more out of the deal. Not much of the DLC (outside of Tiger) is going to see a huge savings. And it remains to be seen what we will be seeing with web content for future titles. Tiger has never had it, and to my knowledge neither has NHL. If they would have thrown in NBA Jam like cdj had said as part of the early deal....or even offer it to us for 50% off, things would look more attractive. EA is going to get killed for this though. Anything with an upfront cost, and incremental savings is always viewed as a money grab. See the Joystiq article for views on that. On top of that, this will be for a good deal of people (those who play MUT, those who buy accelerators), and it's not going to be for the majority of this community (unless you see the cost to justify getting it on Friday or Saturday instead of Tuesday). Much like Paakaa, it won't be something I'm going to buy today, but maybe sometime later this month I'll look into it. I spend a heck of a lot more than $25 on random crap throughout the months and year that is worth less than this would be in the long run. I'm not sure if I'll jump in on this or not but I will say that in the past, I've spent upwards of around $25 extra just to be able to get NCAA the weekend before release. To me the added bonus is being able to have a full-fledged "demo" of the game, even if I have no intention of buying it (ie try out FIFA for three days and see if it's worth a purchase). That's kind of lame. I'd basically be paying $25 a year just to play Madden and NCAA three days early. Meh. Is it worth it??? Tough call but I will probably slurge just to get Madden 12 early... have to talk it over with the accountant.. er I mean wife. As mentioned earlier, for those that play all the EA sports games, it could be worth it. For me, I only play NCAA yearly from that list, so $25 for 3 days early.......eh, not overly excited about that although the opportunity to download it early is still semi-appealing. Wish they had a tiered pricing instead, like I could play $10 for NCAA early only. have to talk it over with the accountant.. er I mean wife. I can already see mine saying no and hitting me with a question like "Do you really need it?" ...And I would answer "no not really"
Who the hell would even consider this. I just don't understand how anyone that has played these games in the past, would consider paying for a early bugg filled experience only to have to wait even longer to get fixed by patches. Even if ea's reputation was perfect I would be hesitant to pay for a yearly fee to be in this little club, then pay full price for these games to play them and have nothing in my hand to sell or trade back in. This is a way to cut out the selling and trading of their product. Ea has yet to make a game that was lifetime keeper material. I guess after 20+ years of gaming it may be time to get off the wagon if this is where it is headed. Even when I buy EA games on launch day they're riddled with bugs (see: NCAA 10, NCAA 11, NCAA 12) and I have to wait a month or two AFTER LAUNCH before the game is patched and running like it should. So why would I want to spend an extra $25 to add three days to my suffering and frustration? IF I get it I will get it about a month before NCAA 13, or right before Tiger no sooner though. Kinda pointless for me now. I think this is awesome just based on the fact I will be able to get Madden 12 and NCAA 13 the weekend before release. My, my, people are sure spoiled these days. Starting to realize I'm growing out of video games. New CoD map packs no longer excite me nor does paying $25 a year to get a game 3 days early (that I still have to pay for, so $85) doesn't appeal to me. Sorry for being negative but all these 'extra' benefits need not exist because the prices are getting a tad ridiculous. Having to pay for each little thing is tad much but to each their own. You're not paying $85 for each game though. I think what he is saying is that he only buys NCAA so in essence he is paying $85 for it.